The North Pole Postal Company | Christmas letters and gifts directly from Santa! Welcome to The North Pole Postal Company. Nestled in their wintery wonderland, and shrouded by the Northern Lights, The North Pole Postal Company, design, print, and post the most magical and personalised letters for children of all ages. The band of merry elves are led by Jingle, Head Elf, who oversees all of the workshops, and divisons of The North Pole Postal Company. She is joined by Jangle, from The Behavioural Analysis Department, who assists Santa in compiling The Naughty or Nice List. Posty Elf ensures the personalised letters are sent out in time for Christmas, and are received by all the children across the world. Christmas is such a special time, and Santa and his elves at The North Pole Postal Company, work hard every year to share the magical, festive cheer. Children capture the majesty of Christmas, and from an early age, believe in its magic, and that of Santa Claus. Jingle, and all of the elves, cherish their roles at The Company, and look forward to sharing their love of Christmas, with you and your family. Our Christmas Letter Workshops are now CLOSED, so we can allow Santa, the elves and reindeer to prepare for their big night on the 24th. Santa, Mrs Claus, Jingle and all the elves have loved being a small part of your Christmases. Thank You. We want to wish you all a very Merry Christmas, and a happy and ‘elfy New Year. Love The North Pole Postal Company. Letters from Santa are magical and beautifully written. Letter arrived today. Darcy was thrilled. Thank you so much for all the effort in making it personal and the certificate. Delighted. Merry Xmas. My children had their magical letters today! Wonderful. Excellent quality; made personal and authentic. My grandson was very excited to learn he’s on The Nice List. Just wanted to say thank you so much for the letters for Owen and Carwyn delighted was an understatement. Have a wonderful Christmas all. 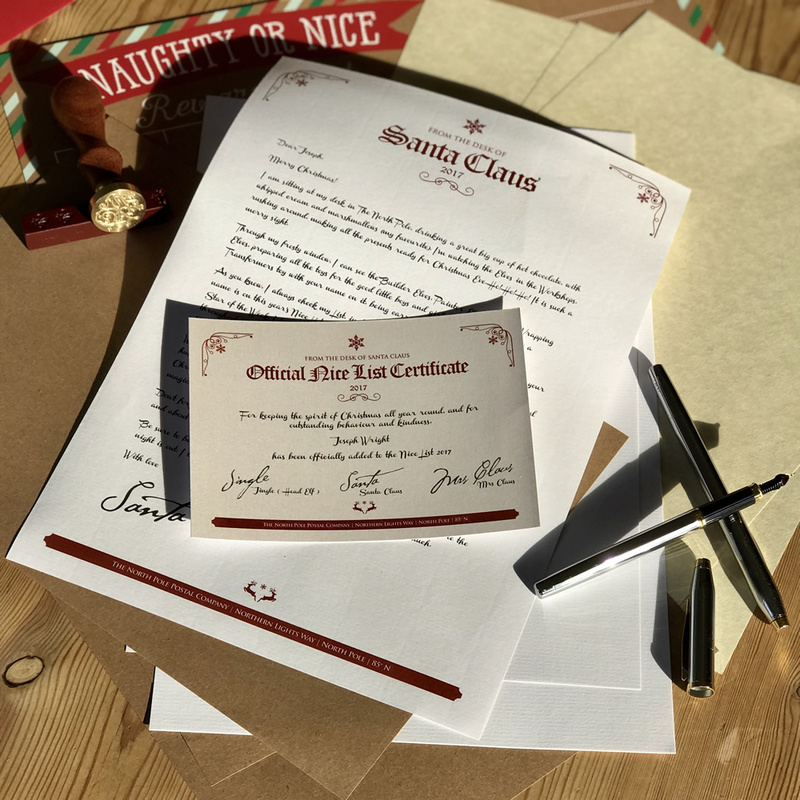 Nestled in their wintery wonderland, and shrouded by the Northern Lights, The North Pole Postal Company, design, print, and post the most magical, personalised Santa letters, for children of all ages.